Many people ask me if I’ve ever been scared, if I’ve every experienced something frightening in the wild. Sure – sometimes situations occur that can be a little…disconcerting. We once had a bull elephant that every evening, right at sunset, crossed a shallow lake just a short distance from our campsite. I had seen him several evenings in a row and as he crossed the lake the sun’s rays danced across the ripples spreading out from his enormous body. I tried to find a spot from where I could film him but it was difficult because there were only a few low, thorny acacia bushes around the lake. 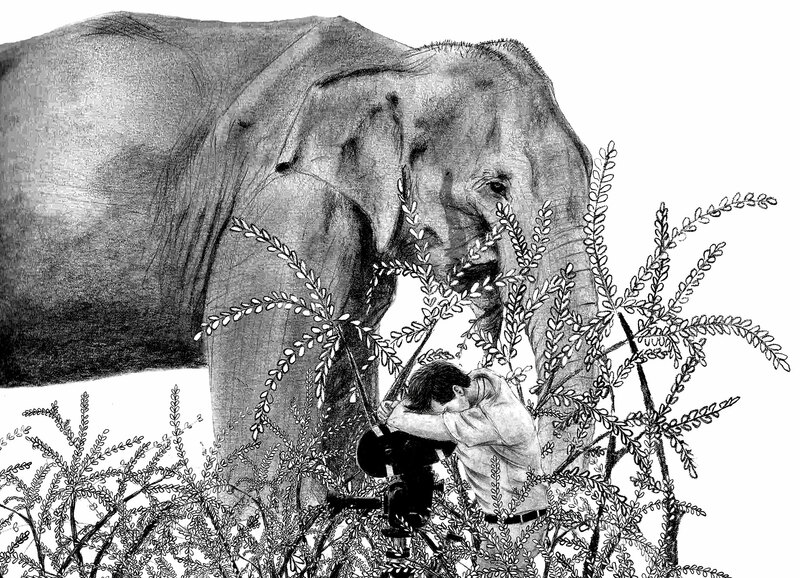 One afternoon I chose one of those bushes about 75 yards from the path where the elephant walked every evening. Sure enough, he came on time that evening, too. I had set up my camera so I could capture the glittering sunlight on the ripples as the elephant crossed the lake, but this evening was different. The elephant stopped near the water’s edge for a moment, then turned suddenly and walked briskly, straight to the little bush I was using as camouflage. He stopped right next to me and began to eat the bush, which just barely covered my head. I bent over the camera and held my breath. This was not good. Why had he changed his habits this particular evening and chosen my bush to eat? I could see the enormous feet just in front of me and heard how he tore and pulled at the branches with his trunk just a hand’s width above my head. I also knew that the elephants in this area didn’t have the best reputation. People had been killed in encounters with angry elephants, especially the bulls. Now one was standing right in front of me. Running away would be futile. There was no other place to hide and outrunning an irate elephant is impossible; they are too fast. If I startled him, it would only make my situation more precarious. No, I sat still and contemplated my perilous position. After a few minutes that seem to last an eternity, the elephant turned slowly to the next bush. I took a deep breath and felt that my chances of surviving increased with every step the elephant walked away from my bush. He stopped about 15 yards away and then turned around and came back! He finished off the last few branches that remained in my dry old bush that was now completely useless as camouflage. I sat still expecting him to grab me by the hair or wrap his trunk around my body. Strangely enough he avoided touching me at all, even though he ate every branch surrounding me.